Ireland’s bowlers must do more to restrict Afghanistan in their second one-day match insists Tim Murtagh. The tourists won the series opener on Monday and can take an unassailable lead with another victory today. Ireland held their rivals to 227 runs but the batting line-up could not cope with the Afghan spin attack. “They’ve obviously got a world class bowler in Rashid [Khan] and I think Mujeeb [Ur Rahman] is probably not that far behind him,” said Murtagh. “I think those two are the main difference between the two teams over the last few years. 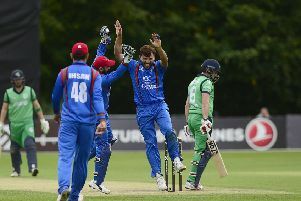 Afghanistan dominated the recent T20 internationals at Bready, winning the series 2-0, and Phil Simmons’ side also won the crucial super sixes match at the Cricket World Cup qualifier in March that denied Ireland a place at the 2019 tournament. The last time Ireland beat their rivals was in a three-match series in December 2017, when they recovered from a heavy opening defeat in Sharjah to win the series 2-1. Ireland’s batsmen have struggled to score against the Afghan spin bowlers in the subsequent meetings between the two former Associate-level teams but Murtagh is confident that his team mates can find a solution. “It’s difficult for me to say what they should be doing but I’m sure they’ll sit down with Ben Smith, the batting coach, and a similar thing happened when we were at Sharjah last year and we lost the first game and the guys sat down and worked a formula to play spin and it came off because we won the last two games,” added the veteran paceman. “With conditions in our favour, as they are over here, I’m still confident that we can turn this around and do the same thing and win [the series] 2-1,” he added.